When you think of art supplies does aluminum foil pop right into your head? No? Well then, you’re pretty normal. Knowing me and my penchant for making art from household supplies this weird foil printing idea shouldn’t surprise you at all! 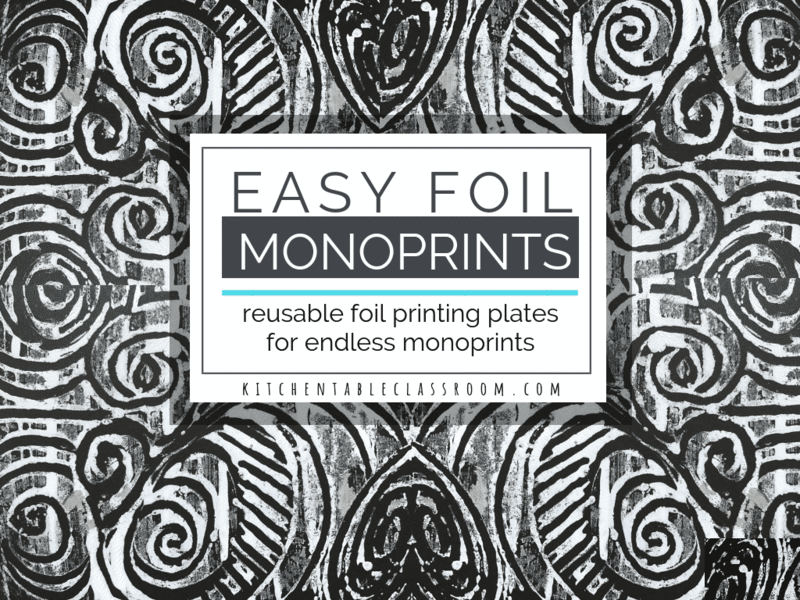 This foil printing method creates monoprints. What’s a monoprint? That means you will only to be able to make one of each image. Hence, the prefix “mono.” The foil doesn’t make the print. The foil creates a printing plate for the image to be made on. And it can be used over and over. Follow along. Printmaking in general is my thing. Monoprinting is at the top of my list because of the spontaneity it requires. This process requires working quickly. There’s no time for thoughtful tiny details or erasures. Big, swoopy movements and quick decisions is what monoprints are made of. Before we can start the fun stuff we have to make a foil printing plate. Good news; even this part is quick and easy. If you are working with a class they can even help you do this. I started with cardboard from a cereal box. I flatten and save all our boxes because a.) we eat a ridiculous amount of cereal, and b.) it is the perfect weight for lots of arty stuff. Your foil printing plate can be any size you desire. I started with a smallish rectangle, maybe 6 x 8. Lay cardboard on a slightly larger square of foil and fold edges of foil around the back. I fastened the edges with a couple pieces of packing tape for longevity’s sake but I’m not even sure I would have had to do this. 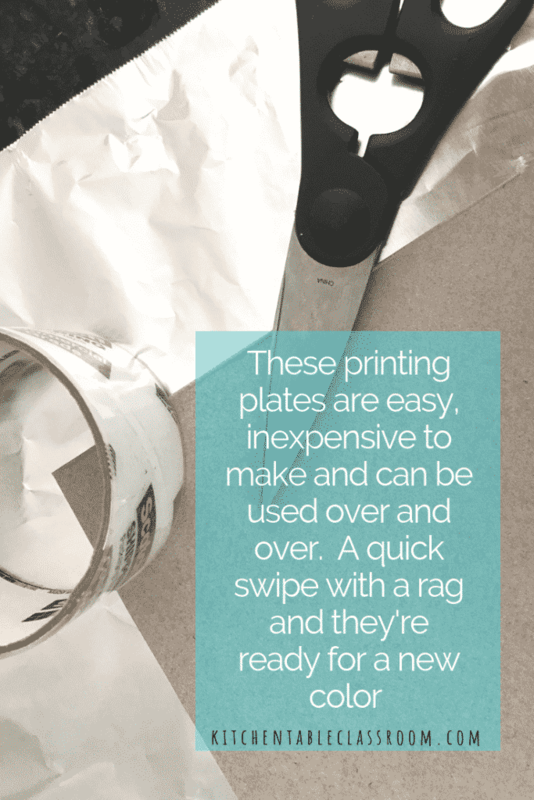 Flip that printing plate over and you’re good to go! Creating the image to print…. Like almost every project we do I used craft acrylic paint. It has a consistency that is easy to work with and it comes in many awesome colors, including metallic like we used today! (This set will keep you in business for many projects to come!) Acrylic paint is not washable. Know your audience. Washable tempera paint will work just fine too! Plop a bit of paint right on your foil covered board. Use a flat brush to smooth the paint from edge to edge. Grab a Q-tip and draw a spontaneous and awesome picture right in in said paint. Too much paint on your foil printing plate is bad, really bad. I was oohing and ahhing over how pretty the foil printing plate looked coated in white and metallic gold paint. So pretty. But the resulting print was squishy and the image was completely obscured by the extra paint. So, that process described above? The paint foil board, draw on foil board, take a print of said drawing, that one? Do that. 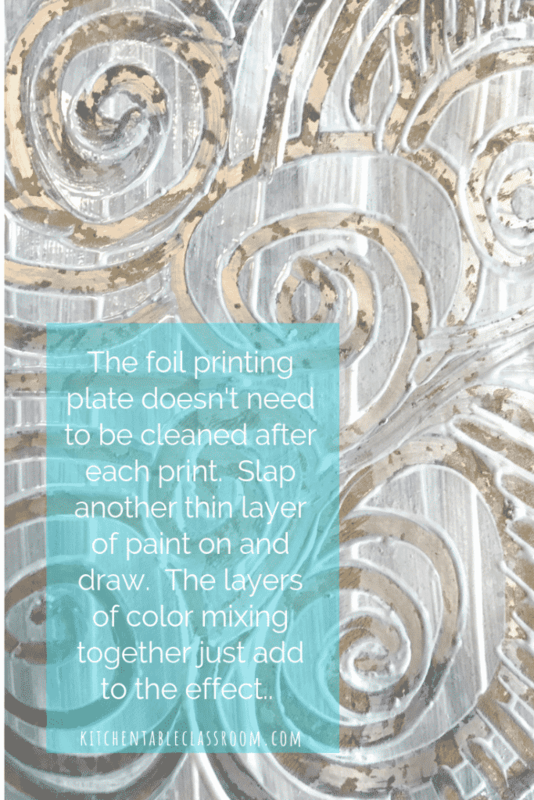 Except this time paint a layer of paint on your foil printing plate so thin it’s barely there. Then work quickly with that Q-tip. I kind of like that this requires you to work quickly. It takes away all the pressure of perfection! After the foil prints that had too much paint I just smoothed the paint out with a brush and started again, no cleaning at all. When there was very little paint left I just painted right over it with a new color. I think the flecks of other colors add depth and interest. And, lucky you, this really simplifies the process. Paint, draw, print. Try it all. 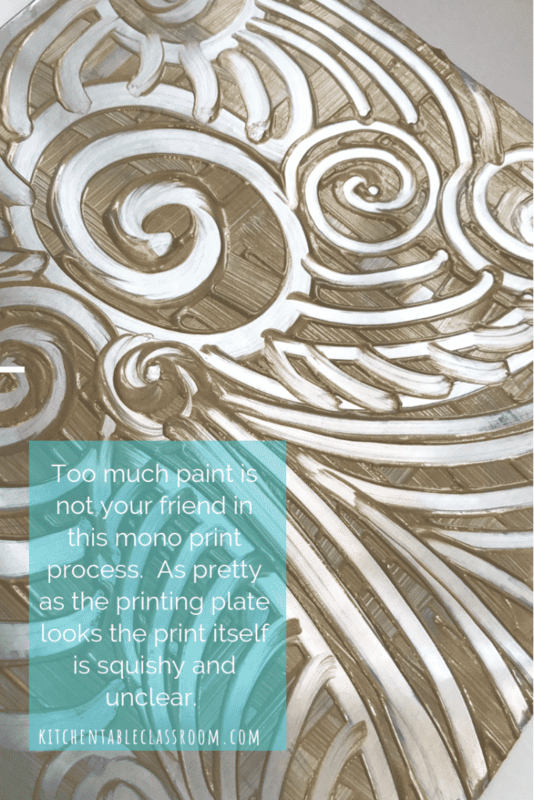 Although you’re creating monoprints the foil printing plate can be used over. Paper is cheap. Really, let your kids try working with any colors that float their boat. Our most striking prints were the result of paper and paint that had lots of contrast. And of course, anything metallic is awesome. 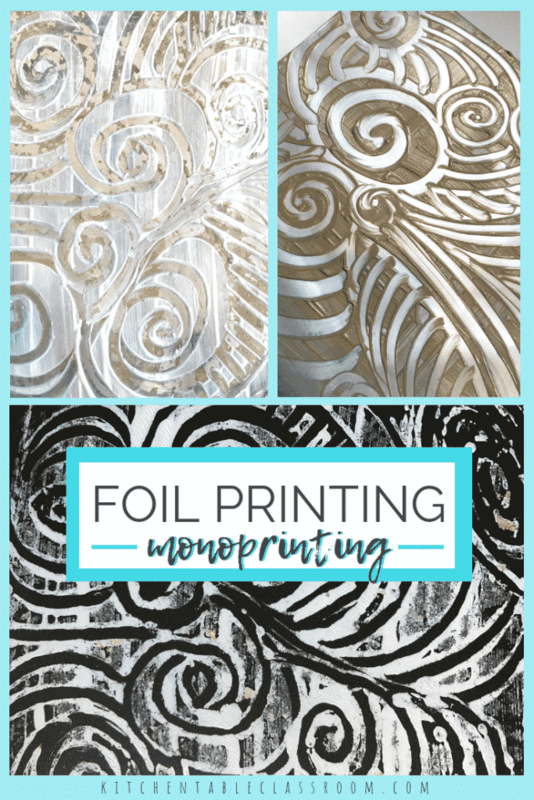 This foil print process is simple enough to allow some experimenting with the materials. 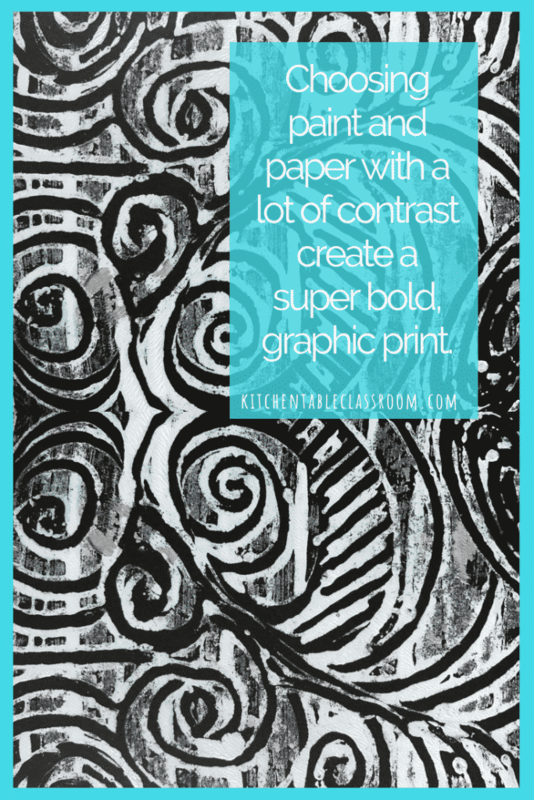 Think outside the box and print on top of newspaper print, old artwork, or tissue paper prints. Layering different materials and processes is a great way for kids to get sophisticated results. If you enjoyed this foil printing project please consider sharing it on your favorite social media channel. 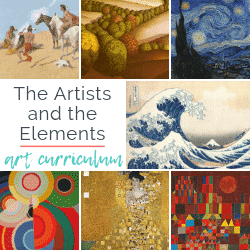 Thank you so much for putting together so many wonderful and very useful resources! Thanks Betty! I’m so glad you find them useful! Thanks Sharita! I’m super looking forward to it! Sharita~ I just found your blog and found you on Pinterest! LOVE!!! What kind of paper works best for this project? Pretty much any kind of paper will work to recieve the prints. I actaully prefer thinner paper, like copy paper weight, for printing.